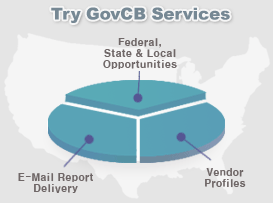 GOVCB provides you direct access to thousands of active cities, counties, schools, hospitals, airports, and state bid listings matched to your business profile. Virginia |	Delta Airport Consultants, Inc.
Bid opportunities, RFPs, pre-RFPs, awards from federal, state and local. Daily Email Report on bids based on keywords, categories and regions. Vendor Profile to find teaming partners. Accelerate your response to bid notices by receiving daily email alert. Access the most extensive coverage of bids in all industrial fields without any additional fee.